For as much fun as I make of the farmer's market in town (they have two booths that sell tie-dye, one that sells gluten-free brittle (ya think! ), and only about 4 actual farm stalls, I still manage to do fairly well when I need to buy produce. I got corn for $3.50 per dozen and it was delicious. 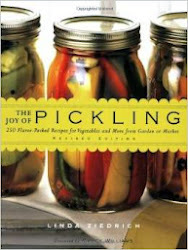 I bought boston pickling cucumbers when mine were just eeking along. And, best of all, last week I bought 10 pounds of plum "seconds." Seconds are the fruit that are either not ripe enough, too ripe, or somehow marred but totally edible that the farmer cant sell at the regular stand because they arent pretty enough. Basically its ridiculous, but sometimes they will sell them to you for less. In this case plums were going for $4 per pound but I got my seconds for $2. I got 10 pounds of gorgeous and tart Red Heart plums for $20. It was a steal. Red Heart plums, I serious recommend buying them all! Place chopped fruit in non-reactive container with lemon juice and 1 cup of the sugar and leave in the fridge overnight. 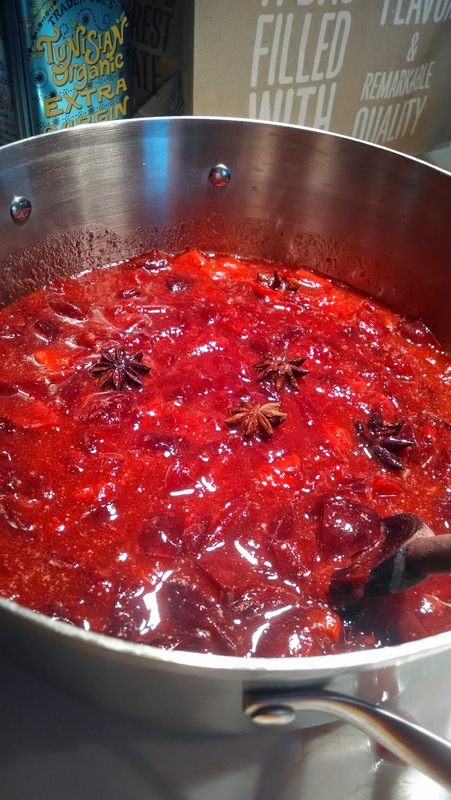 Heat the jam pot and toss in the star anise. Toast until aromatic. Add the chopped fruit and all the juices. Boil until reduced and add the calcium water. 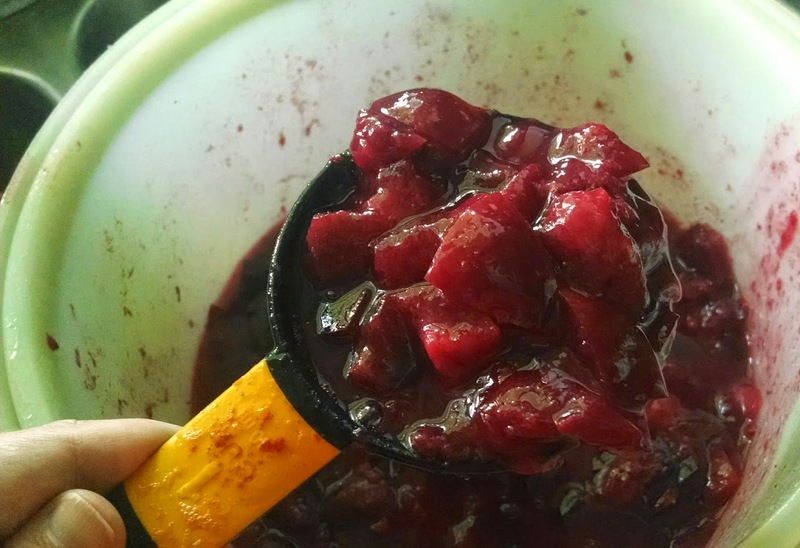 Combine the remaining cup of sugar with the pectin and slowly add to the fruit while stirring vigorously. Bring to a rolling boil for 2 minutes to allow pectin to dissolve. Remove from heat and add to canning jars. Process in water bath canner for 10 minutes. Its been a bit quiet around here. The winter has made everything go dormant in the garden for some time now so there hasn’t been anything to update on that front. Instead, I have spent my time learning to sew. It has kept me busy and added variety to my fairly classic wardrobe. I have to admit that I have a fair bad fabric purchasing habit. I keep churning out garments though…so hopefully that will be okay in the long run and the stash problem will take care of itself. Also on the homestead front, we have demolished our fire place. It was giant and ugly (in my opinion) and sent hot air rushing up through the chimney during the times when we needed it in the house most. In its place we installed a Country Hearth 2000. 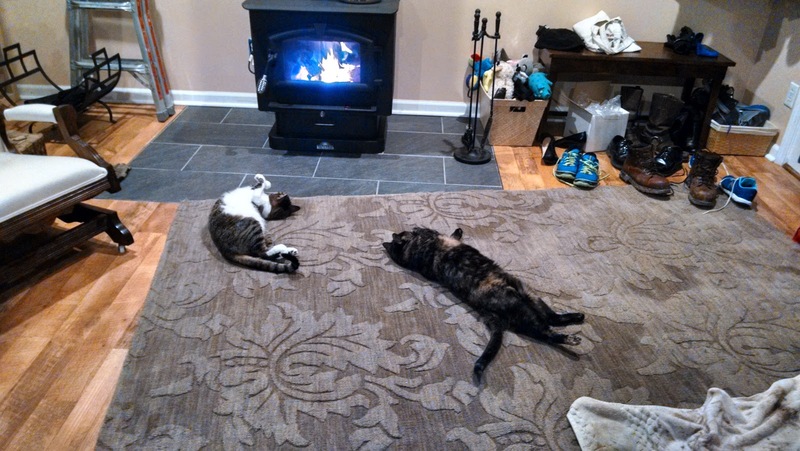 We have been lighting fires to warm the house since mid-January and are totally smitten. In the mornings we do use the furnace to get the house warm enough to talk ourselves into taking our clothes off to get in the shower, but our heat in the evening and nights has been 100% fire-generated. We are really hoping it cuts our electric bill in half as our last bill was almost $300. Anyone looking for more info on swapping out the fireplace for a wood stove can leave me a comment. 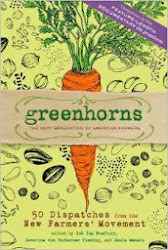 Given that its now January, I am trying to get back into a gardening mindset and have ordered seeds for this coming growing season. The in-laws got me a wire rack and a fairly serious grow light for my seed starts so we are eager to get going. 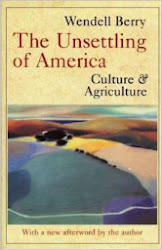 The winter hasn’t been too bad but I am still anxious to see little green shoots poking up through the dirt. The grow list of fairly extensive. We reduced some things that grew too well (rutabaga) and removed some items that didn’t produce enough or were space hogs (fava bean, lima beans, and sweet potato). We have also added something that we thought it would be nice to stop buying at the store (broccoli). This next season we are going to concentrate more on dealing with the produce from the garden. Don’t get me wrong, we pickled and froze and canned and dehydrated a lot of stuff last year but by the end of the season we were fairly spent and some things fell by the wayside. The rutabagas actually froze in the ground and when I tried to harvest them, they were all transparent and bubbly – gross! I had read they could be kept in the planting beds all year long but that was obviously written for someone if a different climate. Also, we harvested a few pumpkins and winter squash last year and felt them out to cure. That would have been okay except that I forgot them out there and they froze…several times. I managed to save half of them by roasting them and pureeing the flesh but the others were too far gone. It was sad. We are also building on some things that did surprisingly well in the garden and that we found to like to eat a lot more of than I had anticipated. 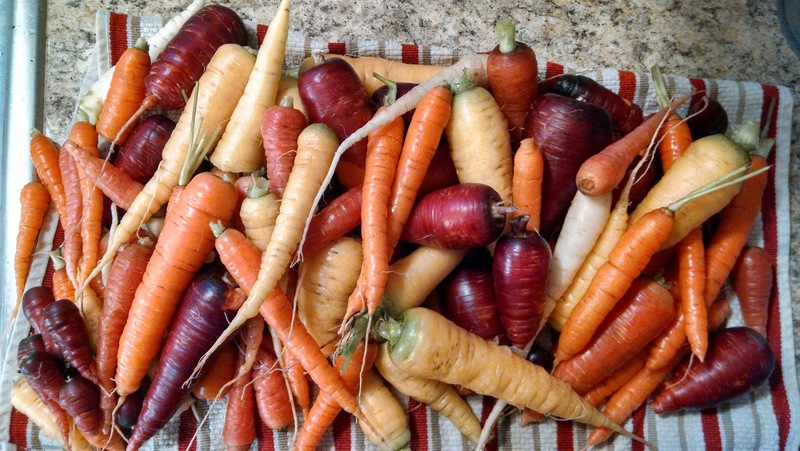 On a whim, after ripping out the fava beans, I sprinkled a packet of mixed carrot seeds over the soil and basically forgot about them until I tried to wrench the rutabagas out of the frozen ground. Thankfully the carrot tops seem to have formed a protective frost barrier over the ground that they only had to be lightly chiseled out of the dirt. The array of carrots we got was so wonderful and unexpectedly tasty that we added them to the list rather than grow them as an afterthought. The Chinese long red noodle beans were also great and I want to be certain to freeze more for stir fries and soups. In addition, it would be nice to have enough cucumbers at once to pickle so I have upped the number of plants to grow next year. 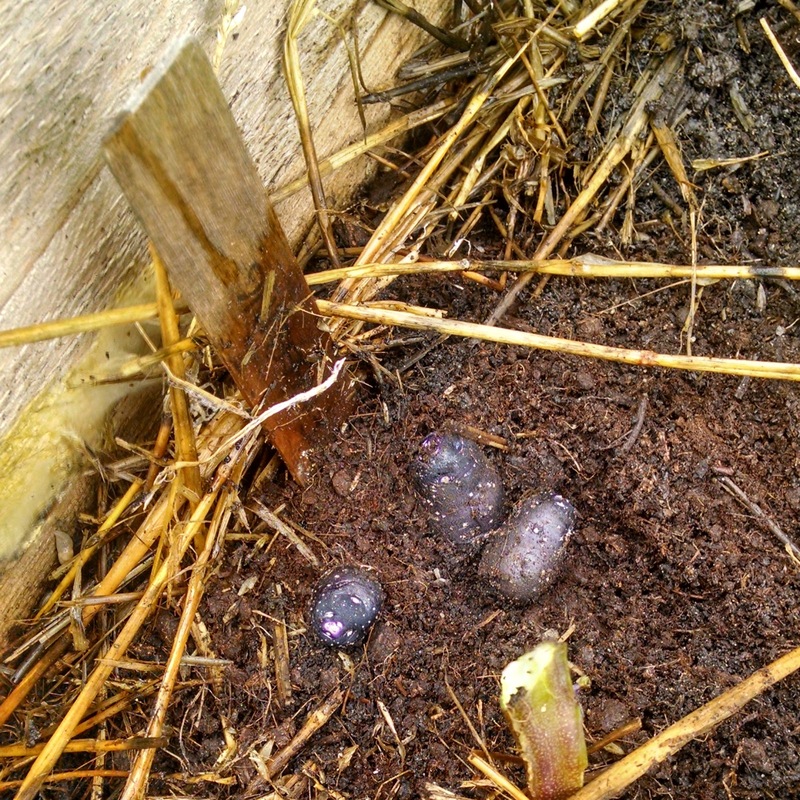 Lastly, the purple fingerling potatoes that we grew as a test last year were prolific, cured well, and were really tasty. A few are lingering in a basket in the kitchen as I am afraid to use the last few and not have enough to sprout in spring. There were lessons learned last year too and as such, the garden layout will change. The tomatoes over crowded, well, just about everything. It wasn’t a very warm summer to begin with but the shade didn’t help the peppers or the okra do their thing. The tomatoes will be planted on the back side of each raised bed to allow light to any little guys in front – this should also help with the powdery mildew on our squash plants (though that’s generally to be expected with as much rain as we got). We might also get the rain barrels in this year so we don’t have to water with a sprinkler, also cutting down on mildew in the garden. I have high expectations this year since we had such a great season last year. I didn’t can as many tomatoes as I wanted since the cool summer kept the fruit green but I turned that green fruit into delicious salsa so I really cant complain. The pickles I made last year (once I figured out what the protector on the bottom of the pot was for) turned out totally awesome. The spicy cumin summer squash and the bread and butter pickles are super tasty. Lets hope I don’t fly too close to the sun! It looks like a super long list, but most of them are direct seed so there isn’t much hassle in seed starting and the ones that are started indoors are pretty much plug and play once you get them in the ground. One more month for the first of the seed starts! Sometime ago my husband and I realized that the apples we ate in the summer came from Chile. This is not earth-shattering news, nor is it something that we werent at least a little aware of, but we finally decided to do something about it. 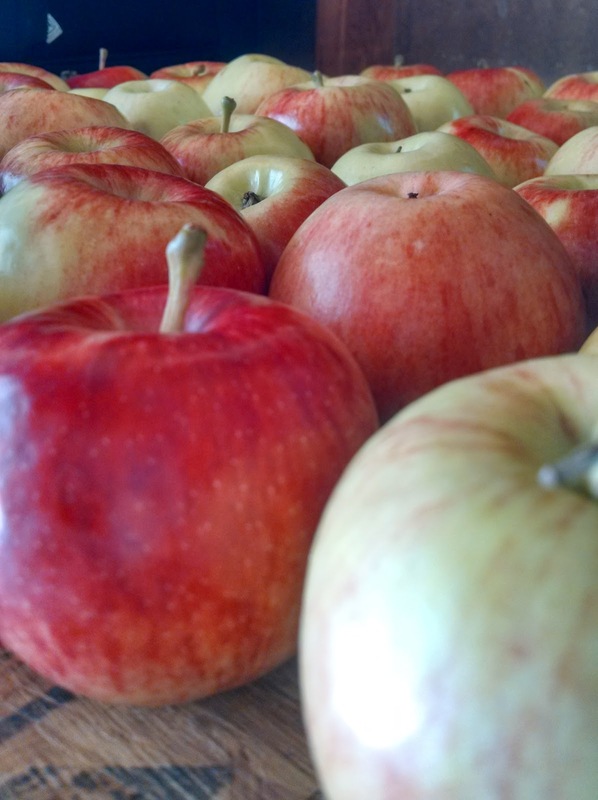 Now that its apple season here in Indiana. It pretty difficult to change your snacking ways when there isnt much of anything else that easy to pick up and take on the go. There are nuts and chips, but there isnt much summer fruit that provides the durability of apples. We ended up at our Farmers' Market and went back to Wild's Apple Farm where I had first picked up some plums. We picked up two of each kind of apple and headed home to eat them over the next week in an attempt to determine which we preferred. Turns out we like some fruit that doesnt really have a name, but a number. It grew on a particular tree in a particular plot in a particular row on a particular orchard in Pennsylvania. That particular apple never made it to the commercial sector probably because its green and red skin is easily marred. The fruit beneath the blemish is totally fine so its another full bodied apple that actually taste like APPLE that isnt available to the general public. One half bushel of our lucky apple later, we were home and wondering what we had gotten ourselves into. We had 20 pounds of apples to store and process before they went bad so I got out my mandolin, filled up the sink, and washed some apples. We have an Excalibur dehydrator but I had never filled it to capacity, using only a tray here and there , so I didnt actually know how many apples slices would fit at once. It turns out the machine will fit about 17 medium sized apples which is a pretty good haul. A few slices into the journey to desiccated apples, I noticed we had a problem. 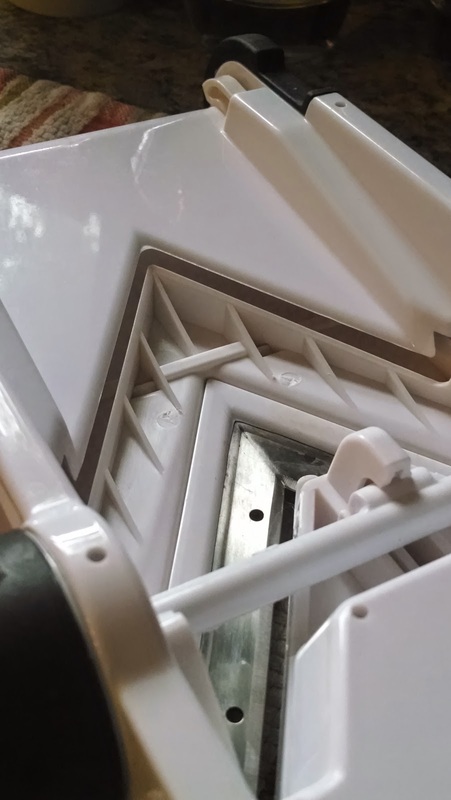 The slice was getting stuck under the mandolin and wouldnt allow the slice to drop down,causing the next slice to crumble. 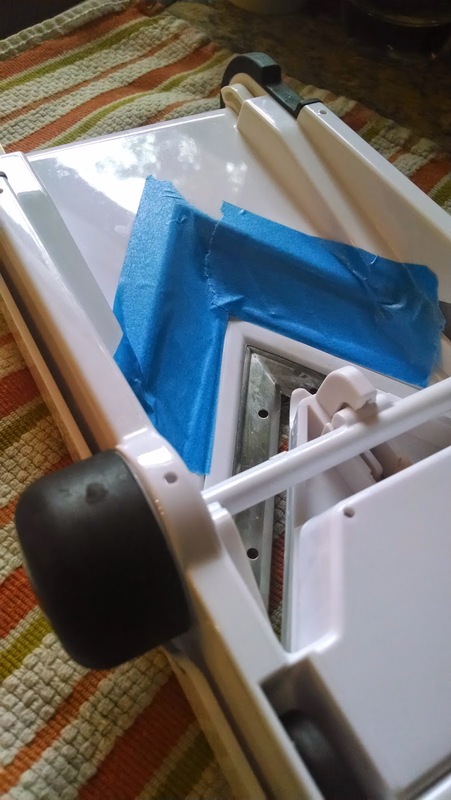 I ended up using painters tape on the underside of the mandolin to cover the gap where the produce was getting trapped. Once I jimmied my slicer, I didnt have any more problems with the apples. 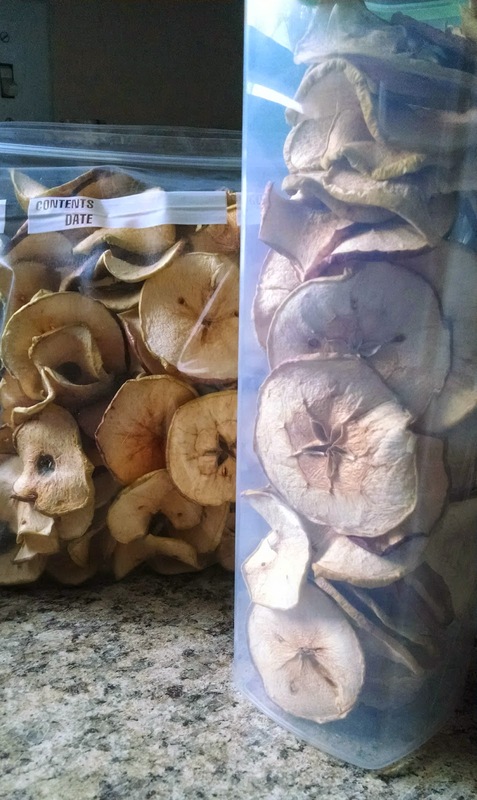 I threw the sliced apples (1/4 inch thick) into a giant tupperware with two tablespoons of lemon juice so they wouldnt brown while they waited for the dehydrator. Once the tupperware was full, I transported them into the Excalibur* and placed them single file over each of the drying racks. 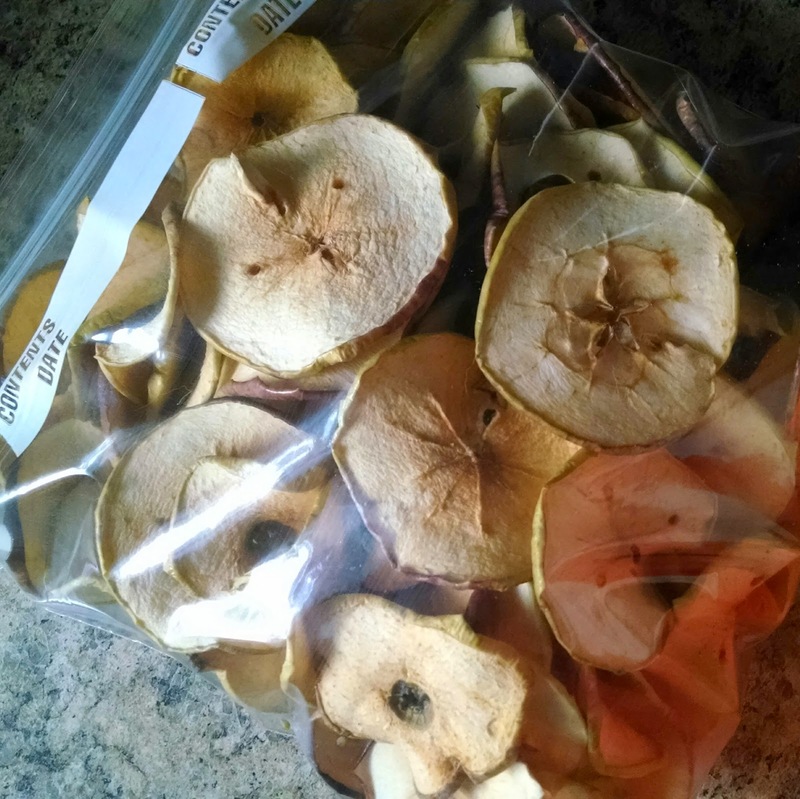 Then I turned the dehydrator on to 135 degrees and left them until the next morning...about 13-15 hours. When they were done, they were light, crispy, and delicious. I stick mine in a plastic bag and throw the bag in the freezer for at least three days. This time in the freezer stops the formation of any eggs laid on them while drying. Because the Excalibur is so quick, I dont really think spawning flies from the dried apples is very likely, but I have read some horror stories on other blogs so it pays to be safe and worm free! Hopefully they will make a great late spring and summer snack next year when all the local apples are gone and the grocery stores are shipping their supplies in from Chile. *We have our Excalibur in the garage. Its a bit loud, which I can get over, but it circulates air to dry the items inside so your whole house will smell like whatever is inside the box. 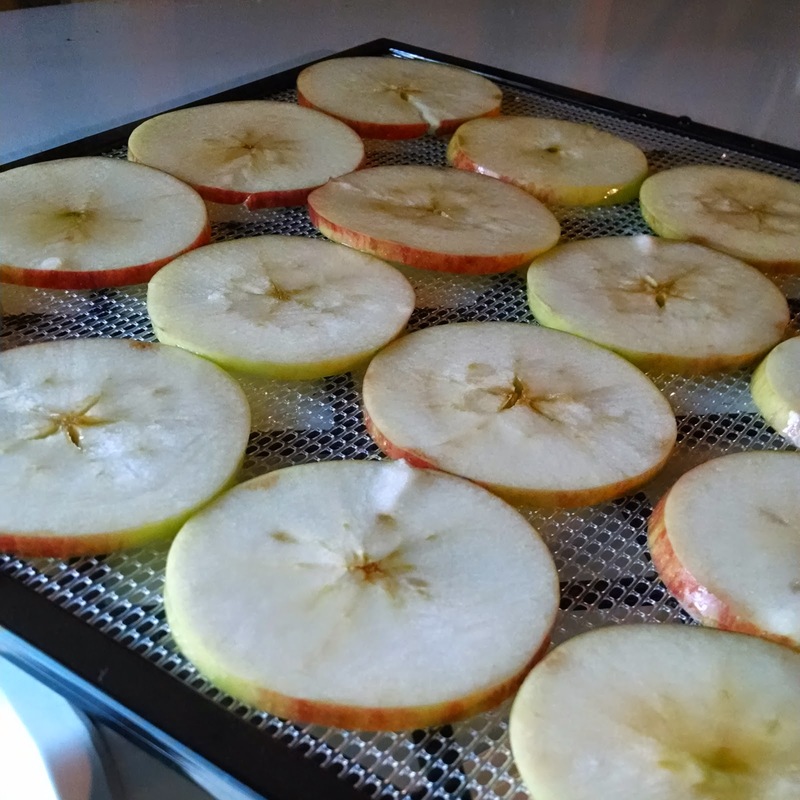 In this case the dehydrator circulates sickeningly sweet apple scent. I learned this little trick after trying to dehydrate garlic...the entire house smelled like garlic breath - I kid you not! Thank goodness you found me. An LA transplant to the mid-west, I am living my dream of setting up a homestead. This blog will follow my attempts and aspirations towards a more sustainable way of living. Along the way there will be big changes, new animals, raised beds, and recipes so add me to your blogroll and follow my progress. Glad you came!